It's been a whirlwind week for 20-year-old Vincent Trocheck. 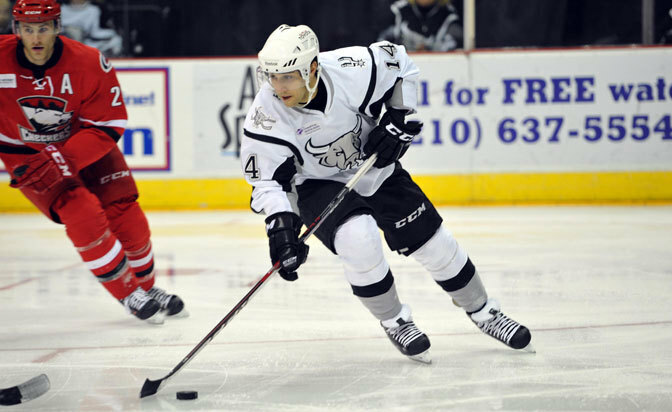 The rookie forward with the San Antonio Rampage of the American Hockey League received his first call-up to the Florida Panthers on Wednesday, just after the NHL Trade Deadline passed. He's expected to make his NHL debut for the Panthers on Friday against the visiting Buffalo Sabres. "It's been crazy," Trocheck said. "It's obviously what I've been working for my whole life. Getting the call was surreal and I couldn't be more excited to be here." Trocheck began his path to professional hockey long before arriving in the Sunshine State. A Pittsburgh native, he was born in 1993, right after the Pittsburgh Penguins won back-to-back Stanley Cups in 1991 and 1992. "Growing up in Pittsburgh was a great influence," Trocheck said. "The Penguins were doing really well whenever I was young so that kind of got me into hockey and it all started there." He spent four seasons in the Ontario Hockey League with the Saginaw Spirit and Plymouth Whalers. During that time he was picked by the Panthers in the third round (No. 64) of the 2011 NHL Draft. Last season, split between Saginaw and Plymouth, he had an OHL-high 109 points and won the Red Tilson Trophy as the most outstanding player in the OHL. The 5-foot-10 center also won a gold medal with the United States at the 2013 IIHF World Junior Championships; he had three goals and three assists in seven games during the tournament. Trocheck's decorated hockey resume made for a smooth shift to the pros when he joined the Rampage at the beginning of the 2013-14 season. "I moved away at a young age so I kind of got used to the whole being-away-from-home thing," Trocheck said. "We have a really good group of guys in San Antonio, so they made the off-ice transition pretty easy. "On the ice it was just different coming in. Everybody was bigger. I heard before I got here that the speed would be the biggest thing but I didn't see much of that as a problem to transition." Former NHL player and coach Tom Rowe, who took over as coach in San Antonio when Peter Horachek was promoted to Florida in November, has overseen Trocheck's development in the AHL. "What we like about him is his competitiveness," Rowe said. "He comes to the rink every day and loves playing, and he's a rink rat. He's here morning, noon and night. "Vince is not afraid of the physical side of things. He sticks his nose into the traffic areas, and obviously his skill and the way he can set up plays [are what make him special]. For a first-year guy he's probably adapted to pro hockey as quick as anybody that I've coached in the American league." Trocheck leads San Antonio in goals (16), assists (25) and points (41) in 54 games; those totals also rank him in the top 10 among AHL rookies. Rowe recognizes the motivation behind the forward's impressive numbers. "He wants to be in pressure situations," Rowe said. "He wants the puck when the game is on the line, which is a real good trait to have, and I think that's what drives him. "The thing that has always impressed me is how good he wants to be, how he will compete for loose pucks, take hits and hit guys … a lot of skilled guys don't necessarily do that stuff." Trocheck's thought process on the ice is simple. "I just try to stay even-keeled and focus on playing my game," he said. "And that's what I've been doing." He credits the cohesiveness within the organization that drafted him for the success he's had so far and trusts that it will continue to help shape his future accomplishments. "It's a great organization in Florida and they pride themselves on having good character, which is huge," Trocheck said. "In San Antonio we have a great staff. Tom Rowe has done a great job since he's come in and he's really great for teaching young guys. "There are things that [the Panthers] want me to improve on and that's what I've been working on [in San Antonio]. Tom has gone through everything they tell him I need to improve on and he relays it back to me and helps me on it." Barely five months into his pro career Trocheck is poised to take his talents to the next level, according to his coach. "He's way ahead of the curve when it comes to his dry-land training and his preparation before practice and games," Rowe said. "He's in the gym stretching and doing the proper things before we go on the ice. Off-ice, I've never had a young kid be as prepared as he has been in his first year." It's clear that Trocheck has impressed the Panthers organization with his adjustment to the AHL. He gets the chance to take the next step Friday. "He's got NHL hands," Rowe said. "He can move the puck and beat guys 1-on-1 in tight areas that a lot of guys can't. So that part of his game is definitely at a very high level." For the latest news, scores and stats from around the American Hockey League, visit theahl.com.